Photo courtesy of Adrian Steel. 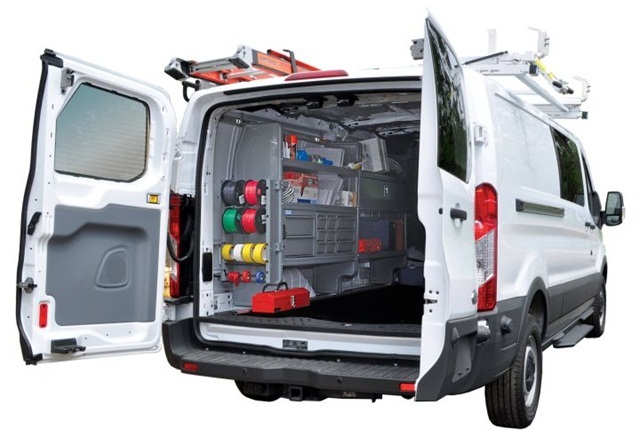 Adrian Steel has released its new line of upfit products for Ford's 2015 Transit van that include shelving, partitions, ladder racks, and trade packages for the low-, medium-, and high-roof versions. Adrian Steel’s exclusive ADseries shelving units are easily adjustable and have been re-designed for the Ford Transit’s three roof heights. ADseries shelving is adjustable by unscrewing two bolts with a Phillips screwdriver. It also comes with plug-and-play shelves to allow a high level of customization. Durable welded shelving, which allows for a higher weight capacity, is also available for the Transit. Partitions create a barrier between the cargo area and the cab, increasing passenger safety and reducing noise, among other benefits. Adrian Steel’s partitions are available with solid or perforated panels and accommodates accessories if the owner chooses. Transit partition options include a fixed center panel, a hinged center panel door, and a wing kit. Adrian Steel has designed an new EZ Load ladder rack for the Transit models. The EZ Load is crafted to make it easy to operate, adjust, maintain, and accessorize a ladder. The EZ Load is a lockable, easy to grip ladder rack that is designed with ergonomics in mind. Adrian Steel has also redesigned its popular LOADSRITE drop-down ladder racks. The LOADSRITE features an easy-to-reach handle, a glide-out bed platform, and hydraulic load assist to eliminate physical strain on the user. A basic Aluminum Utility Rack is also available for the low-roof Transit.